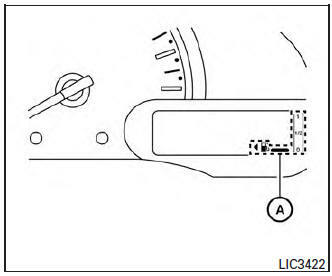 The gauge indicates A the approximate fuel level in the tank when the ignition switch is placed in the ON position. When one segment remains on the digital fuel gauge, only one segment will blink. When no segments remain on the digital fuel gauge, the fuel gauge symbol and the scale will blink. Refill the fuel tank before the gauge registers 0 (Empty). door is located on the driver’s side of the vehicle. turn off. If the light remains on after a few driving trips, have the vehicle inspected by a NISSAN dealer. For additional information, refer to “Malfunction Indicator Light (MIL)” in this section.